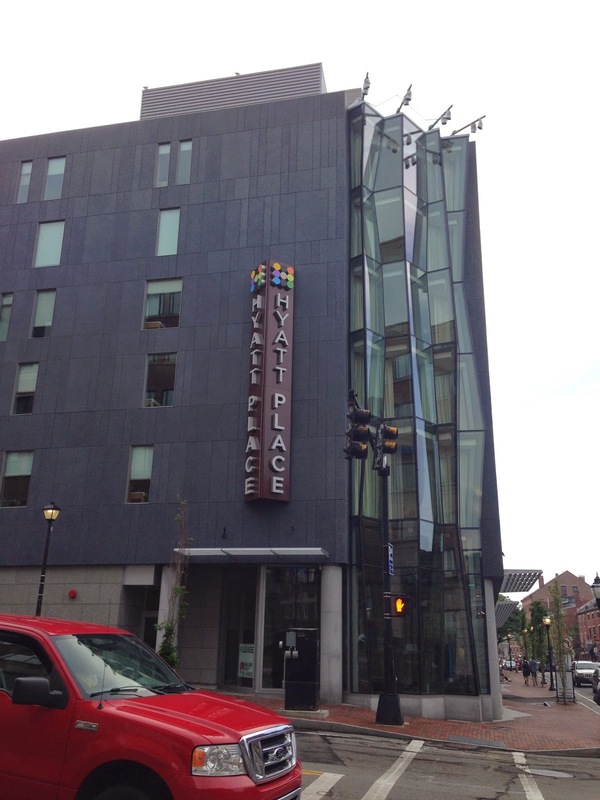 Location: The hotel is ideally located right on fore street in the heart of Old Port. One block from the harbor and within a 5 minute walk of tons of shops, bars and restaurants. For the younger crowd, this location is ideal. The area does have a tendency to get a little loud at night but I never had any trouble sleeping. Facilities: The lobby is very ary and modern with a gas fireplace and sitting area. There is also a fairly hip looking bar. 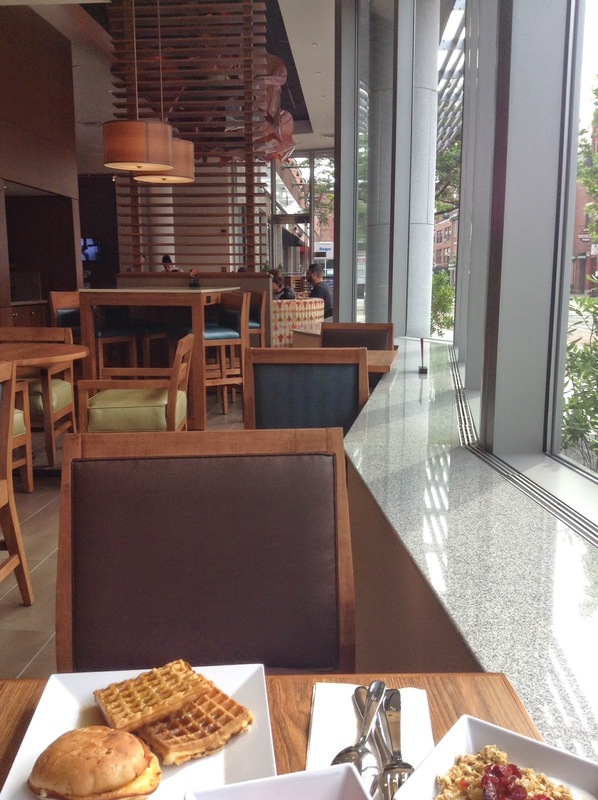 Breakfast was included daily and was the standard hyatt place menu. 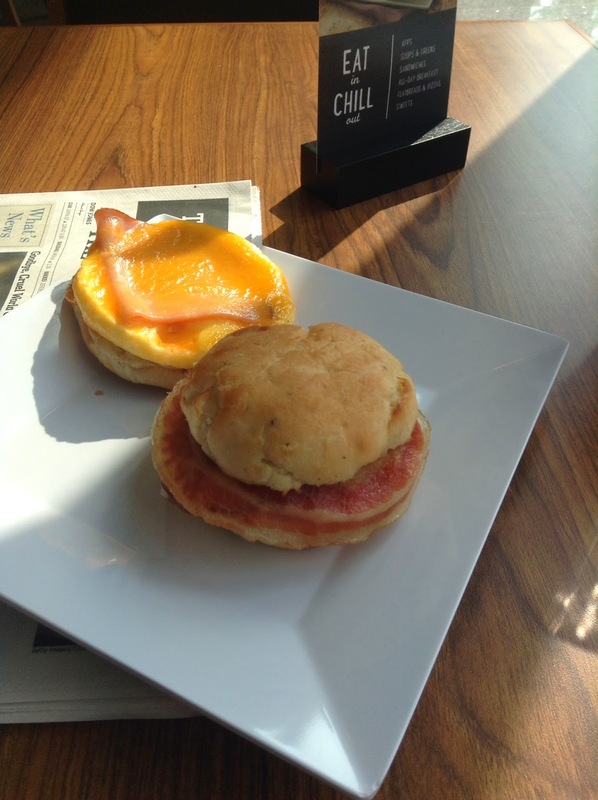 This included bacon and egg sandwiches with gouda cheese, an open faced egg sandwich and either french toast or waffles. Additionally, pastries, fruit, yogurt and oatmeal were offered. Several varieties of juice, coffee and tea were also on hand. Breakfast ended at 9am which i felt was a bit early. There is a small pool and fitness facility. The pool was way too small to swim laps in and is in a very plain white walled room. Room: We had a standard king room booked with points and were upgraded to what the website calls "King bed Speciality (with sofa bed)" These rooms are located at the front corner of the hotel and there is one of this room type per floor. The rooms have amazing floor to ceiling windows in a very intriguing zig zag pattern. 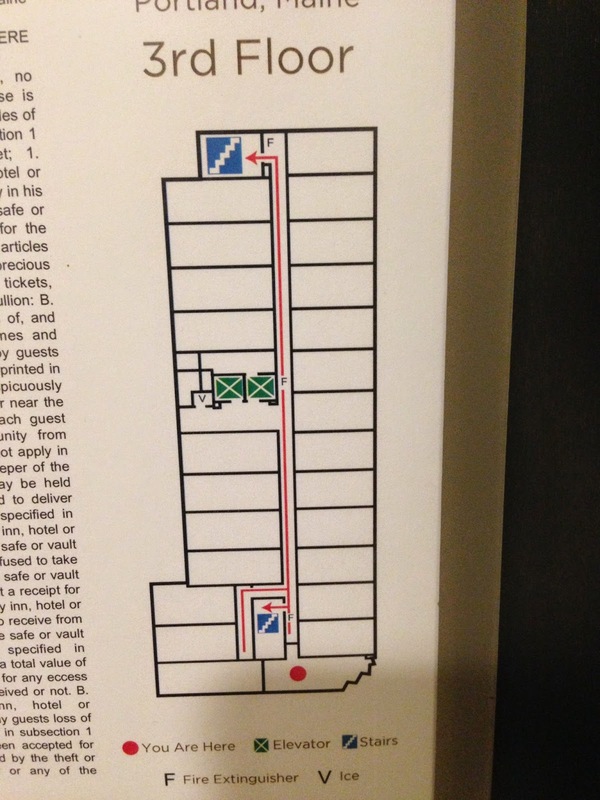 We were originally placed on the 3rd floor which only had views of the surrounding buildings but called down to the front desk to ask for a higher floor and were moved to the 5th floor. What a difference that made. 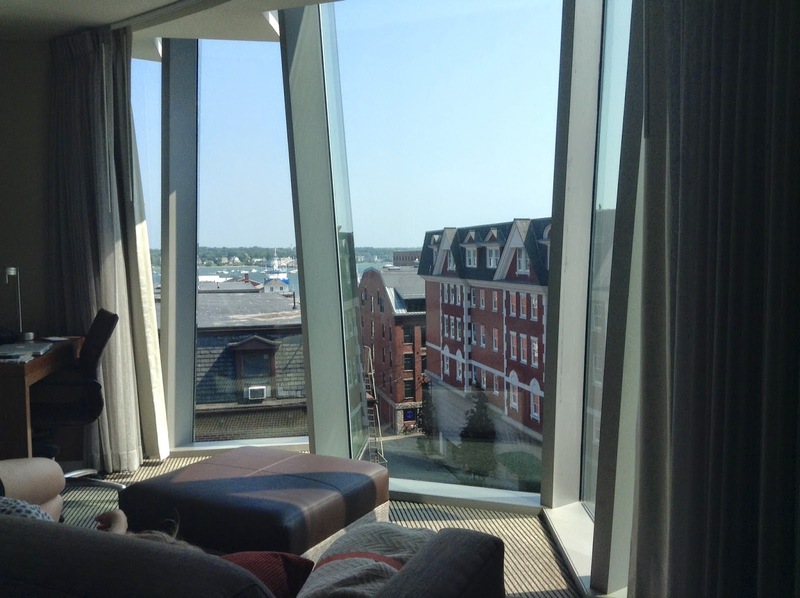 Being two floors higher meant that we could see all the way to the harbor. There was also a sofa bed, mini fridge and bar area. 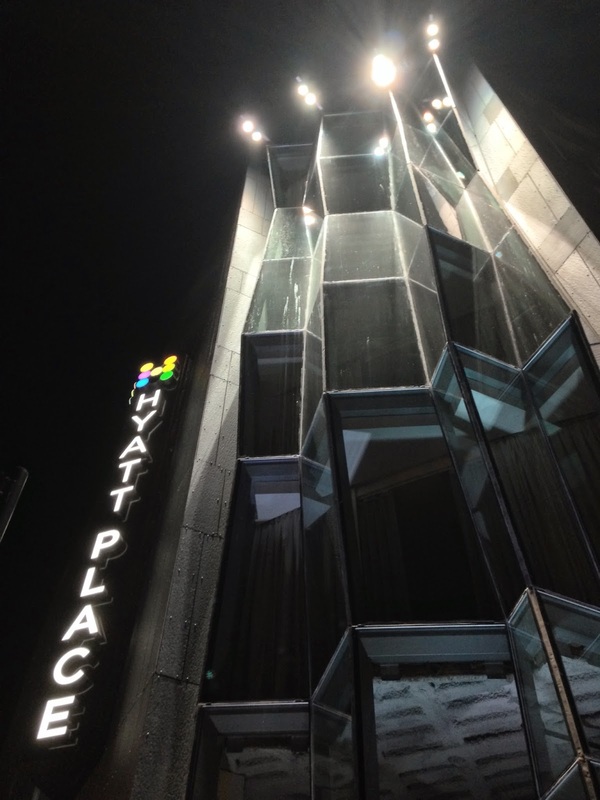 Overall I thought that the hotel was excellent and was a great value as a category 2 hyatt. I did however have 2 issues with the room. The first was the mini fridge was not working and all of our food spoiled. It was initially unplugged but I was unable to get it to work even after plugging it in. The second issue was the water pressure/hot water in the shower. It literally took 10 minutes each morning for the water to heat up. On top of that the water pressure was very low. Aside from these 2 areas, i would highly recommend the hotel to anyone with some extra hyatt points and interested in visiting portland.